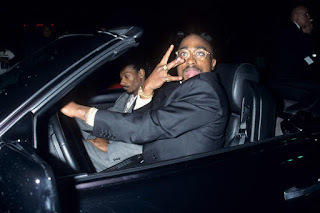 Home » entertainment » Happy Birthday 2Pac! Here's to a true legend. It's 2Pac Shakur's birthday, so let's celebrate the man who helped pioneer the culture into what it is today. Whether you listen to his music or not, Pac's influence can be felt throughout the hip-hop community, and his memory remains celebrated by pretty much every rapper in the game. And while his biopic may not be the critical success fans may have hoped, the mere fact that Pac's story is being given the mainstream spotlight is an testament to his legacy. I remember the first time I heard 2pac, on his collaboration with Bone-Thugs-N-Harmony "Thug Luv." It was one of the hardest tracks my young mind ever processed, with Pac's sneering baritone gliding over gunshot percussion. His presence absolutely commanded that track, and I came to learn that was pretty much standard practice for Pac. I'm sure all of you have Pac memories of your own, and please feel free to share them in the comments below. So let's take a moment to mourn the loss of an icon, bump some Pac music, and wish him a happy birthday!